For years Atlassian has sent teams to Cambodia to help with literacy and other programs. At Web Essentials we use Atlassian products at our core as a developer of high quality web applications and websites. So I thought, "Why not ask Atlassian to spend some of their time here sharing their world class technical and management abilities to assist us building our Fair Trade software?". 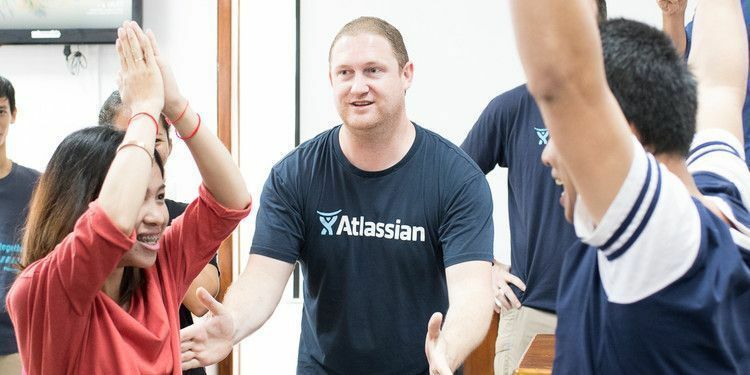 We had our first phone call with the Atlassian Foundation the after day Atlassian's IPO shares ended up a $1B higher than predicted-- which helps improve one's mood. We thought that a collaboration between keen Atlassians and Web Essentials concentrating on innovative, competitive, short projects would be ideal. We hoped for a uniquely powerful cultural, technical and very personal exchange. At Web Essentials we have been intentionally injecting innovation into our corporate culture through many practices including Innovation Days which are partly inspired by Atlassian's Shipits. So we teamed up in an innovative collaboration: A joint Shipit/Innovation Day! So it happened that 7 Atlassians from the US & AUS, arrived at our office in Phnom Penh to join our 60 strong team! We asked everyone to come up with ideas, concepts & prototypes to improve productivity at Web Essentials with Atlassian products. Starting with a warm welcome, a schedule review and silly icebreakers; we moved quickly into our teams to do an Experience Canvasexercise to make sure the concepts were well understood by each person in each team and everyone understood their role and tasks. As the morning progressed the normal buzz of an Innovation Day took on even more energy. Excited, seriously committed visitors who bring a slightly different way of doing things helped to up the ante. The teams charged ahead, all focused on the coveted 1st Place accolades, as well as the knowledge of the company/personal benefit from the exercise. Unexpectedly (but probably predictably) there seemed to be a mini competition among the Atlassians for bragging rights. By late afternoon reality had truly set in and now teams were thinking, "How will we pull all this ambition together into a deliverable at 1:30pm tomorrow?". In the evening some folks were tired and went to bed early, others played football, others continued to work into the night and all enjoyed the amazing Khmer food. People settled into their teams and everyone felt more relaxed about the situation. However, at 2 hours before presentation time and nerves were jangling. Hard practicality settled in. Presentations, demos, team photos, last bits of coding, polishing up front ends; it's all happening. Some projects worked and some didn't. That's the nature of the innovation beast. Presentation time at 1:30 was suitably nerve wracking. It is about doing well in front of your peers.... well, maybe a little added adrenaline focused on winning too! There was an added element of those from Atlassian wanting to do well for their Web Essentials team mates and vice versa. It helped Atlassian product managers to look at their products from a user perspective. There were many technical and organizational benefits. But given the Cambodian backdrop we must not forget the humanity benefits that this brings to the individual exchanges between people coming from vastly different backgrounds. This all contributes to creating a value chain from Atlassian, our employees and our clients who also care about Fairly Traded software. Next time? Everyone is definitely up for it! For more insight into how we build innovative, world class Fair Trade software: Contact us today! Jon has been in IT Sales for 20+ years with customers and partners in the US, Mexico, UK, Germany, Switzerland and Cambodia. Jon enjoys the unique challenges and tremendous opportunities to develop people while developing Fair Trade software. 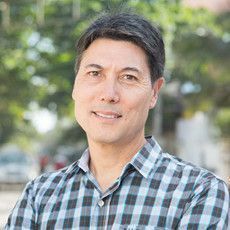 He studied Business at San Diego State University in California and is always interested in new business opportunities.